Agra fort is a popular Mughal architecture construction. 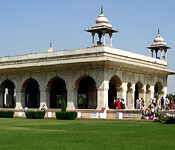 The design of the Red Fort belongs to Mughal architecture Ustad Ahmad. The Red Fort was once palace for the Mughal King Shah Jagan’s new capital city Shahjahanabad, which is the 7th city at the Delhi region. Later on, he shifted his capital from Agra in order to develop prestige to this region and also to deliver vast chance to explore his target building interests and schemes. Delhi, then served as a capital to the Mughal’s until the year 1857. Later, Bahadur Shah Zafar, the mughal emperor was deported by British Indian Government. The fort was constructed along the banks of the river Yamuna, which feds the moats around the walls. The north-eastern wall corner of the fort is situated close to another old fort called Salimgarh Fort, which is a defense constructed by Islam Shah Suri during the year 1546. The process of construction was initiated in 1638 and finished by 1648. 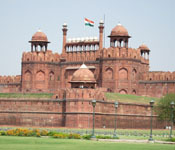 Red Fort has faced many improvements after the construction done by Emperor Shah Jahan. The important stages of development are during the period of Aurangzeb and later on followed by Mughal emperors. It was credited as UNESCO World Heritage Site in the year 2007. Earlier Red Fort was constructed by Anangpals, a Tomara King, currently called as Qulb Mosque. The name is derived because of the extensive usage of red sandstone to construct the massive walls of the fort. Shah Jahan initiated the building process of the Red Fort during the year 1638 once he fixed his capital to Delhi from Agra. This royal palace was constructed under the supervision of an architecture, Ustad Ahmad. The construction process was initiated during the holy month of Muharram specifically on May 13th 1638. The construction was carried out under the direct supervision of Shah Jahan and finished in the year 1648. The Fort was earlier known as “Qila-i-Mubarak” (the blessed fort) due to the accommodation of royal families. The Fort is not like other Mughal forts, where the layout of boundary walls of Red Fort is asymmetrical in order to hold and linked with the olden Salimgarh Fort. The significant focal point of medieval city of Shahjahanabad (currently Old Delhi) is the fortress palace. The aesthetics and planning of Red Fort is an example for the excellence of Mughal creativity which spread during the period of Mughal Emperor, Shah Jahan. Followed by Shah Jahan, his successor Aurangzeb covers Moti Masjid to king’s private palace and built Barbicans in the front of two major gates, thereby making a circuitous entry to the palace. In the year 1803, at the time of second Anglo-Maratha War, the British East India Company forces defeated Maratha forces during the battle of Delhi, and ended the Maratha era in city and also their grip over fort. Following the Battle, the Britishers held the administrative powers for the Mughal territories and placed a Resident at Mughal courts in the Red Fort. Bahadur Shah II ‘Zafar”, the final Mughal king to reside in the fort outbreak as symbol of 1857 rebellion opposing the British with the help of Shahjahanabad residents. In spite of being the resident of Mughal kings and their defensive qualities, Red Fort was not guarded till the uprising in 1857 opposing the Britishers. After the failure in the rebellion, Zafar went out of fort on September 17th. He came back as a prisoner to Red Fort and was tied in 1858 by British rulers. He was then departed to Rangoon on October 7th. As an end to the Mughal era, the British rulers officially sanctioned to remove and sell all the valuables in the palace of Red Fort. In the year 1863, British rulers demolished several buildings in and out the fort, gardens were filled up and all the valuable things were removed and transformed to the fort into a military structure. Following Indian independence, the region faced minor changes in the form of alteration of addition to its building structures. Even after the independence, Red Fort remained to be used as cantonment. An important portion of Red Fort was under the hold of Indian Army till December 22nd 2003, and then it was delivered to Archaeological Survey of India for the purpose of restoration. The Red Fort is widespread in an area of approximately 254.67 acres of land surrounded by 2.4 km of defense walls. Defense walls are punctuated with the help of bastions and turrets. They differ in their altitude right from 18m on river side till 33 m towards the city side. The fort was constructed like an octagon shape where the north-south axis is longer than east-west axis. The usage of double domes, floral decorations and marbles inside the buildings of the fort illustrates the later stage of the Mughal architecture. It displays a high-end form of ornamental work and art. There is a belief that the furniture’s are engraved with Kohinoor diamonds. The piece of art in the Red Fort is a result of merge between European, Indian and Persian art resulting in the emergence of unique Shahjahani style which is extremely rich, expressive and bright in color. Red Fort is one among the significant building structures in India which digest a long duration of Indian arts and its history. Major efforts were taken to conserve and preserve this Red Fort even before the accreditation as monument of National Significance in 1913. The walls of the Delhi and Lahore gates are meant for public whereas the Khizrabad gate is meant for king’s personal usage. However, the Lahore gate remains to be the main entrance which leads to domed arcade possessing shops known as Chatta Chowk (means covered bazaar). Jewelry, silk and various other items meant for the royal household were kept for sale in the Chatta Chowk during Mughal era. Chatta Chowk ends up to large open areas where it crisscrosses large north-south Street which was the actual partition between fort’s military activities towards the western direction and palaces towards its east. Southern end of the street is Delhi gate. Salimgarh Fort (an older fort, connected to the Red Fort by a bridge). It is believed that the sound and light program at the Red Fort is one among the significant highlights of Delhi tourism as it displays a perfect preview of the past medieval reign of Delhi in a brilliant manner. People horde the Red Fort in vast numbers to visualize the splendor and grandeur of past which was center core of the Mughal dynasty. The sound and light show is displayed every day night and delivers a foretaste about our country’s ancient past alluring people to maximum extend. The water entity with historical importance is the Yamuna River, which has witnessed Delhi many times during destruction and restoration from debris in a brilliant manner. The audience will experience a breathtaking experience with the special effects which were employed in a magnificent fashion. The sound and light show starts from the time where Indraprastha was traced by Pandavas in ancient times. At that time, this was an infertile land which was distributed to the siblings by Kauravas when they were obliged to move from Hastinapur. The city emerged out in an amazing style because of hard work of Pandavas. The sound and light show also depicts the Mahabharata where Draupadi was insulted by courtesans in Palace. There are also various scenes to depict the changes in the history of the ancient and medieval era. People can also witness the runaway of Humayan to Iran from the hands of Afghan ruler. The legendary king of Delhi, Sher Shah was assassinated by the approaching cannons while he was in the process of laying siege to fort. One can also witness the escape of Rajput king with his wife. Along with this, people can also witness the most important scene where the Zafar was tried in front of the law court following his failure of rebellion in 1857. Thus the sound and light show proved to be undoubted attraction to transport the tourist into the ancient era when the kings were destructed and new warriors emerged from the debris. The sound and light show is known to be for duration of one hour with packed features of special effects that holds the people’s imagination in a brilliant manner. A valuable depiction of the city was done through Purana Quila with special lights and pictures. Though the city was destroyed several times it aroused in a magnificent manner retaining its original style. The show was launched during the mid of 90’s and still running in a successful fashion. During August 15th every year, the day of Indian independence from British rule, Prime Minister of India hoists our national flag at Red Fort which is followed by a speech about its past broadcasted nationally. 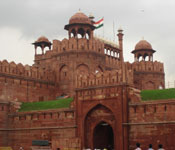 Red Fort is the most renowned tourist attractions in Old Delhi, catching the attention of thousands of tourists every day. It is destined to be one among the largest monument in our Old Delhi. Currently, the sound and light show displaying the history of mughal is a biggest tourist attraction during evening sessions. There is a mixture of the main architectural features. There is no water in any of the water features. Few buildings are really in a good stature and contain all of their decorative elements as such. In other buildings, vandals and looters destroyed the marble inlay flowers resulting in loss of their glamour. There is a functioning tea restaurant which is not of historical origin. The hammam and mosque are not opened for visitors, although one can catch their glimpse by peeping through the marble lattice work or glass windows. The passage for walking is almost in a crumbling condition. There is availability of public washrooms both at the entrance and also inside the park. The entry via the Lahore gate takes us to retail show with crafts and jewelry stores. There is also a museum designed with ‘blood paintings” indicating the young Indian martyrs belonging to the 20th century together with their martyrdom story. One can also enjoy an Indian war memorial museum and an archaeological museum. Air transport is an effecting route to reach Red Fort for visitors from various states and countries. Delhi is easily accessible by several flights inside and outside India. For any foreign nationals, IGI airport will be the primary destination inside India. From Airport, one can prefer any mode of transport to reach Red fort. One can follow these guidelines to reach Red Fort. One has to get down at Old Delhi Railway Station of New Delhi Railway Station. From here, one can prefer Delhi Metro to reach Red Fort. The nearest Metro Station will be Chandni Chowk. There are many buses operated by the DTC organization in the state of Delhi, which is highly effective in transporting passengers with an ease. The starting point will be Scindia house to reach Red Fort. There are several buses to deliver an easy and cheap mode of transport to reach Red Fort. Adult should shed minimum INR 200 to reach Red Fort and enjoy the wonderful light show. Children can enjoy a huge discount with a minimum fare of INR 100. Special buses deliver an outstanding trip from railway station to Red Fort. Also buses ply from well known region of Paharganj which accommodates all range of hotels. People can also make use of taxi facility where there are multiple operators inside the city and transport the tourists without any disturbance.